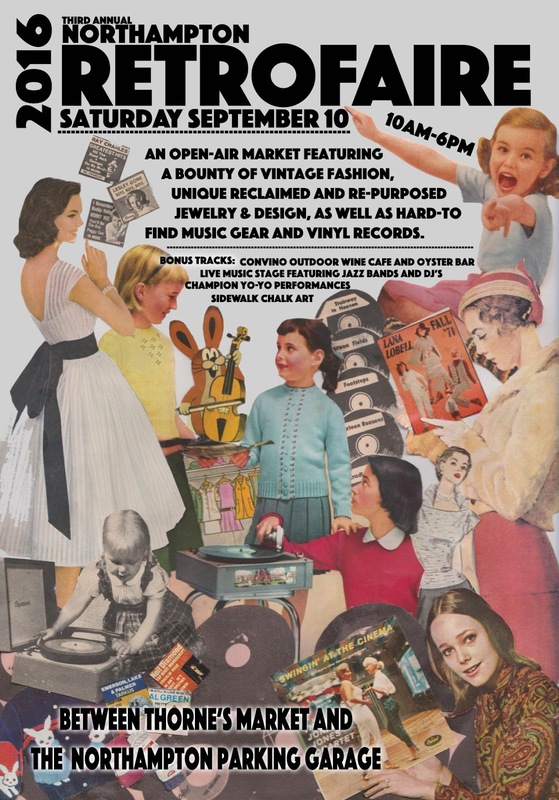 The Northampton Arts Council invites you to the third annual RETROFAIRE Open-Air Market on Saturday, September 10. RETROFAIRE features a bounty of vintage fashion, unique reclaimed and re-purposed jewelry & design, as well as hard-to find music gear and vinyl records. Come check out collections from local and regional vendors selling the finest vintage fashions, the freshest records and unique reclaimed & re-purposed designs. 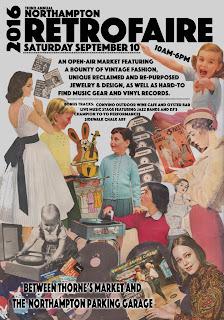 Our vendors include Tiny Anvil, Vintage Steele, Mystery Train Records, Bombshelly Vintage, Spin That! Records & more. Join us for a relaxed day in the late summer sun, peruse the market stalls, hear the sounds of jazz float through the air and kick back for a glass of wine and freshly shucked oysters. RETROFAIRE Open-Air Market will be held in the space between Thorne’s Market and the Northampton Parking garage and will include a live jazz music stage, featuring saxophonist Houston Person with the Green Street Trio at 2:30pm and the Joe Velez Latin Jazz Quintet at 4:30pm. Tom Reney and Kari Njirii of NEPR 88.5 FM fame will be on hand to talk about the history of Jazz in the Valley at 3:30pm, DJ’s will be spinning vinyl, sidewalk chalk art and performances by Northampton’s renowned yo-yo champs. ConVino Wine Bar will have an outdoor wine cafe and oyster bar setup during the event. Why not spend a day supporting art, buying art and wearing art, all while listening to great music and enjoying the savory smell of fine foods wafting in the background. Come to RETROFAIRE Open-Air Market and enjoy the search for quality items that will impress your friends of every generation. All proceeds benefit the Northampton Arts Council’s BJ Goodwin Grant. A grant designed to provide direct assistance to a Northampton-based artist, writer or arts organization in recognition of exceptional work and to support the further development of artistic talents. For more info visit http://hamparts.org.